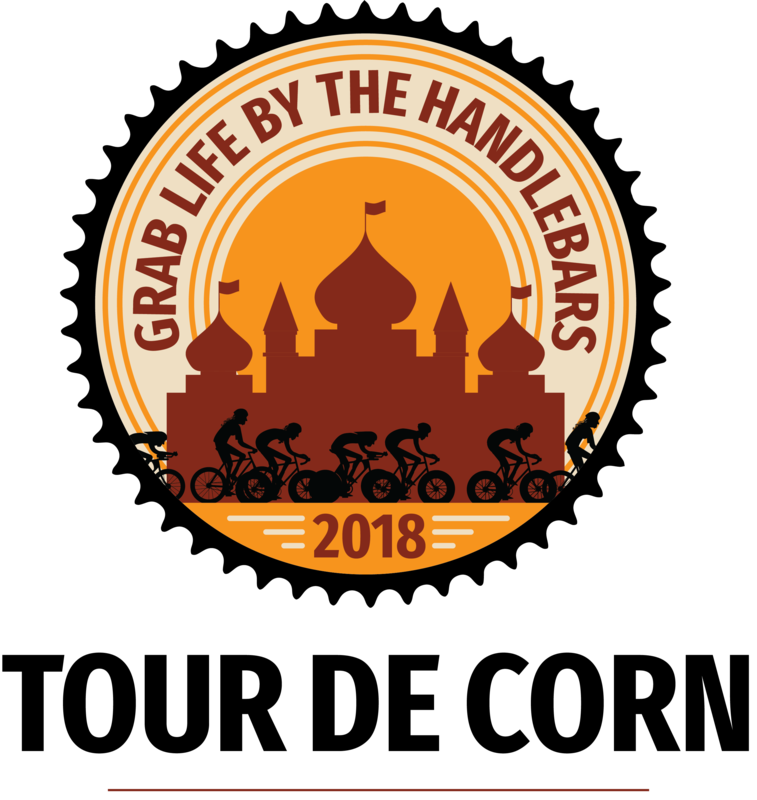 2018 Tour de Corn Weekend - August 17-19! 5:00 - 7:30 pm: Registration and SWAG pickup. 5:30 pm: Pump Track Contest. FREE! Categories for all ages. Parents must come and sign liability waiver for any child participating. 5:30 - 8:00 pm: Pasta Feed and Live Music. Included with TdC fee. Meals for non-riding family members available for purchase. 8:00 pm: Glow Ride/Moonlight Ramble around Lake Mitchell. (State law requires both front and rear lights when riding a bike at night. Helmets required.) Minors MUST be accompanied by their parents. If you didn't register/check-in on Friday night, you may do so this morning. 5:30 am: 100 mi Registration. 6:00 am: 100 mi Ride Start. 8:00 am: 60/35/15 mi Registration. 9:30 am: 60/35/15 mi Start. Noon: Family Fun Ride begins. Post-Ride: Ribs, Music, Door Prizes, and Bike Raffle! 10:30 am: Guided Singletrack Mountain Bike Ride. FREE! 1. How much does it cost and how do I pay? The cost includes all three days events and will be announced shortly. Click here to register for 2018 Tour de Corn. FYI: The Friday Night Pasta Feed is paid for by grants and donations. Your fee pays for your SWAG, Sat lunch, and great munchies at the aid stations. Additionally, because of your support Palace City Pedalers can offer a lower registration fee to children and encourage them to become lifelong cyclists! 2. What are the routes? Maps and Cue Sheets are available below and at the registration table on the day of the tour. 3. What is at the Sag Stations? We have water, power drinks, and various munchies that cyclist love to eat. If you are on one of the longer rides, hot food is available at Buckshots Roadhouse in Letcher. 4. What if I get a flat? We will have 2-3 vehicles sagging the course to help cyclist if they need it. Be sure to pick up a map at registration which will have the emergency contact number for you to call in case you need help. Yes. You may purchase meal tickets for the Friday Night Pasta Feed and Saturday's lunch for your non-riding family members. 6. What if I pre-register but can't ride. Can I get a refund? No. We already ordered SWAG and arranged for the caterer. If you can't ride, come on by during registration and pick up your SWAG. You're welcome to also eat the meals you paid for. 7. What does Palace City Pedalers do with the money raised? We use these funds for two things: (1) To maintain the trails around Lake Mitchell and (2) To promote biking in the area. This past year we donated mountain bikes to the City of Mitchell which are available at the campground for anyone to rent. We also installed an automatic watering system for the pump track. In recent years we have donated bikes, safety vests and helmets to Mitchell Middle School. We donated two bike repair kits to Mitchell Fusion Church which took them to rural Uganda and trained the recipients on how to run a small bike repair business. We donated helmets to the Kiwanis Club Bike Rodeo, and of course we built the trails and pump track around Lake Mitchell. 8. I am a slow rider, how late are the Sag Stations open? How late does lunch last? As long as you stay on the course and leave at 6:00 am (for 100 milers) or 9:30 am (for all other routes), we will make sure that you get to the finish at Hitchcock Park. Yes, we will close down the Sag Stations, but there will be a Sag Vehicle which will periodically check with you to make sure you have enough food and drink. Be sure to ask for the emergency contact number at registration/check-in just in case you need to call. Lunch officially is from 11:00 am - 3:30 pm, but we'll save a plate of those great BBQ ribs for you! 9. Can I take a shower after my ride? Hitchcock Park is right next to the city swimming pool. For a fee you can use their facilities on Saturday afternoon. The City of Mitchell operates a campground on the shores of Lake Mitchell. Private campgrounds (within 5-10 miles of Mitchell) are also available.